“Bettina & Niccolò Corallo” (earlier known as Claudio Corallo) is probably the place, which we have one of the longest relationships with. I still remember going there to buy artisanal chocolate way back when they still had their store in one of the side streets of Rua Escola Politécnica. It wasn’t however until they moved to their current location on the Rua Escola Politécnica just opposite from the beautiful park of Principe Real that I, and later Nora as well, became regulars there. In short, the combination of coffee with various chocolate treats is amazing. 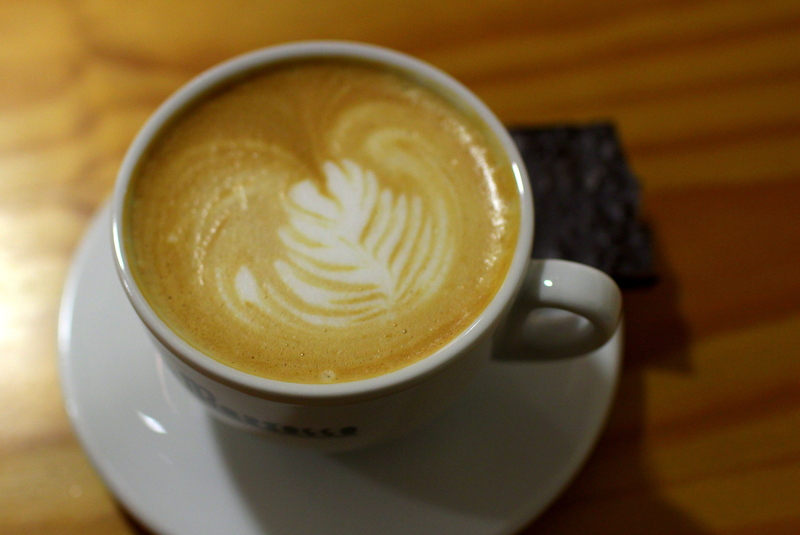 The café carries the name of the Corallo family who has more than 40 years of experience. 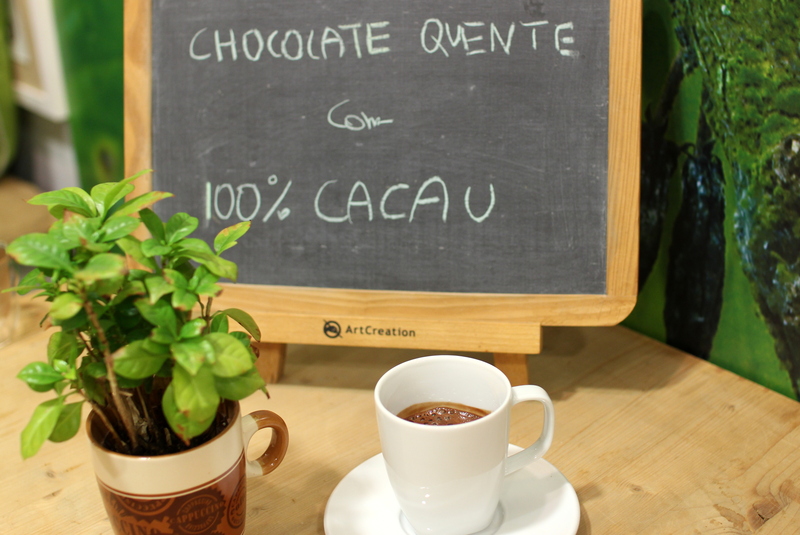 On the two islands of São Tomé e Principe, they produce coffee and chocolate on two estates. They do not carry the official fair trade label (we could write a whole article about the problematic aspects of those kinds of labels anyway). However, they do work with farmers in a way which others might describe as sustainable or fair, but which I would rather describe as the way people are supposed to work with each other, in whatever trade it might be. This should not be exceptional and it’s sad that it still is, but then again, this is the real world, not Nout-and-Nora-fairy-tale-land. Not yet anyway, but we’re working on it. All of the effort is well worth it. The coffee is wonderful, not as lightly roasted as the beans in Copenhagen Coffee Lab and even darker than the beans of Fábrica Coffee Roasters. It is smokey, dark, on the right side of bitter and a perfect accompaniment to the chocolate, of which they give you a free piece to accompany your espresso or cappuccino. 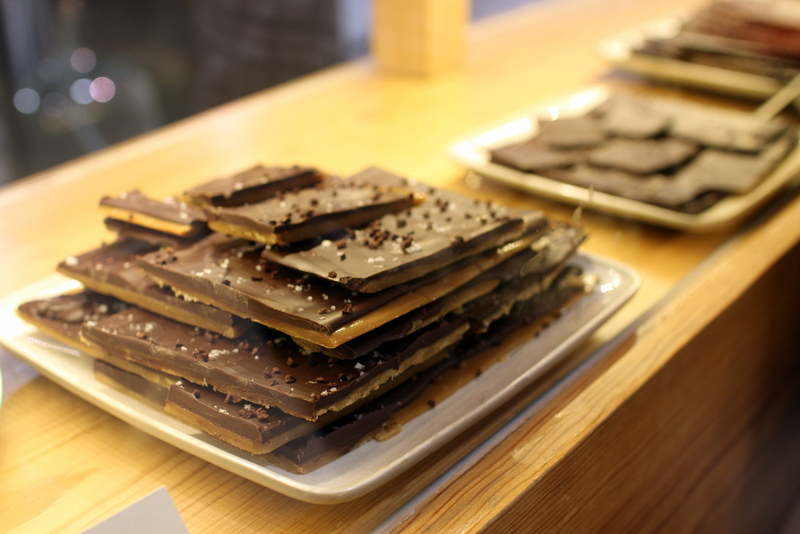 They have several dark chocolate combinations, from hazelnuts (my favourite) to sea salt and pepper to salty butter caramel or pure 80% chocolate with cacao nibs in it. Even though for our taste the chocolate is not the best in the world (that prize would most probably go to Wille’s Cocoa…), we find that the chocolate flavour could be more complex and we generally prefer to eat chocolate pure as it is, but it’s a lovely treat nevertheless and probably the best chocolate that you’ll find in Portugal. A n absolute highlight however for any serious chocolate lover is the “sorvete.”. Technically, it’s a vegan ice cream, but thankfully, it’s not advertised like that (we are very suspicious of places like that). What it is, is no more than Corallo’s finest 100% chocolate, mixed with water and then frozen. Before it is served, a wondrous miracle machine filters out the ice cristals and the result is one of the smoothest, most intense cold chocolate sorbets we have ever had. Other chocolate treats to be had there are a very soothing hot chocolate (again made without milk) destined to make your heart flutter and brownies of which Nora was quite a fan but which for me were bit too sweet and gooey to really woo me over. So yes, there’s really nothing like slipping in to Corallo between work and charge yourself up with their intense coffee. If you’re feeling especially malicious, ask for the espresso duplo and be prepared to stay awake for the rest of the week. It’s a great pick me up and over the last two years, it’s become one of our favorite Go-To spots. The service behind the counter is always extremely friendly and if there was one thing that could be improved here, it would be the size of the space itself: maybe one or two small tables more for people to sit would make it a bit more relaxed. When crowded as it is on Saturdays, it does get a bit cramped. 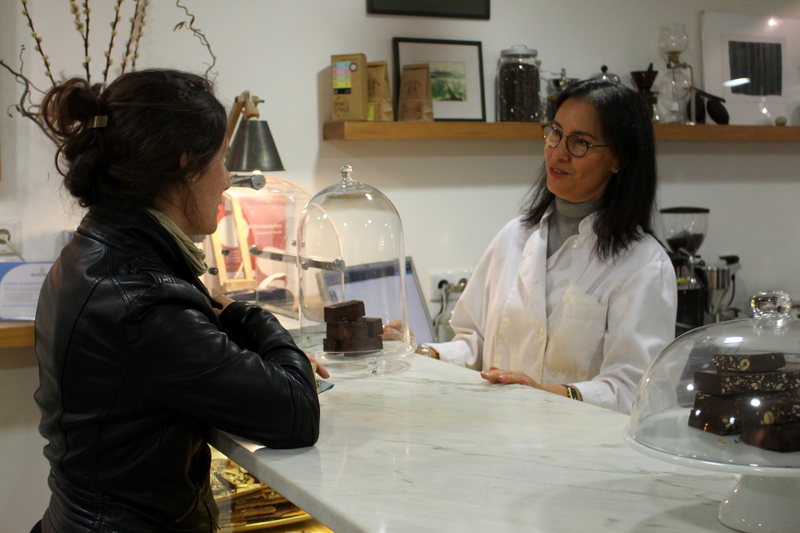 Never mind all of that however, the combination of chocolate and coffee is a classic one, and when done right like at Bettina & Niccolò Corallo, it always feels vibrant and brand new.